Mail.ru Icebox cloud is the "slow" cloud service for keeping big amounts of data for relatively rare access, like magazine archives and old website copies. It is provided by Mail.ru cloud service. 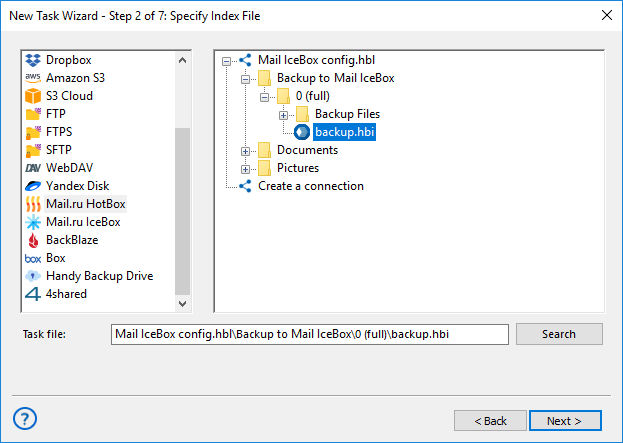 The Mail.ru Icebox plug-in lets Handy Backup using Mail.ru Icebox accounts either as backup sources or as data storages, using the cloud API to make data exchange. 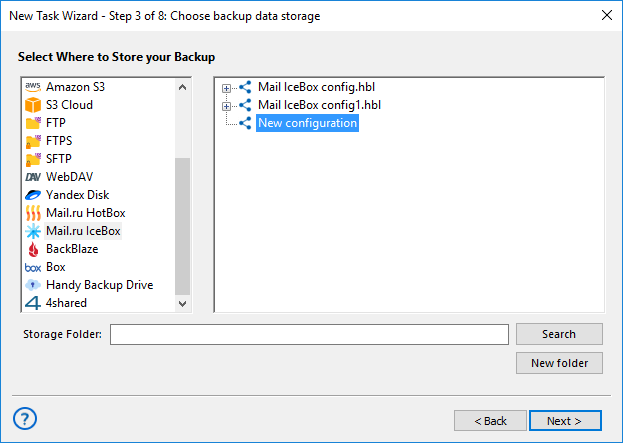 Make a new backup task, and go to the Step 2 to select a backup dataset. Select the "Mail.ru Icebox" option in the "Cloud" group on the left panel. Add it to the list of data sources by clicking on it, and select a configuration for backing up your data from a particular plug-in. If you have no configuration to access your Mail.ru Icebox account yet, click on the "Create a connection" option. 4.1. 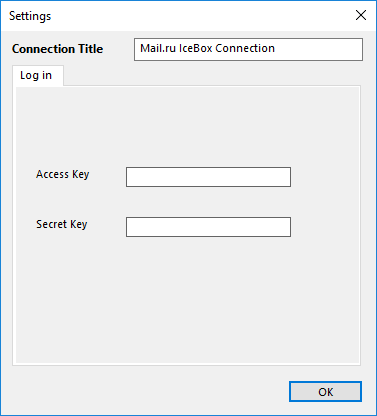 In the next dialog window, enter your keys (access and secret) to a Mail.ru Icebox account, and give some definitive name for this configuration to use it later on Steps 2 or 3. Return to data selection dialog. The program will test your new Mail.ru Icebox connection. Click on your new Icebox configuration to use it as data source. Select the content from your account to backup by marking files and folders with checkboxes. Click OK to continue creating your tasks. Other steps of the task creation are unspecific for backing up from Mail.ru Icebox cloud. If you want to use Mail.ru Icebox as a vault for data copies, select it on the Step 3 of the task creation wizard. Click "Create an account" button in the Icebox connection setup dialog. You will see a new browser window with an Icebox registering page opened. Create your new account by providing and receiving all necessary data for it. After finishing, return to Handy Backup. Now you can use your new account as backup destination. To restore information from a backup on the Mail.ru Icebox, please use the following instruction. Open Handy Backup and create a new restoration task on the Step 1. On the Step 2, select the Mail.ru Icebox plug-in with a configuration that you need. Browse your Icebox content for a file backup.hbi, which is an index file that contains all necessary information about automatic data recovery. Select this file and click "Next" until a final step to restore your data to its original place. If you want to restore data from Mail.ru Icebox to some other place, click "Change Location". 5.1. Select a new place for data recovered from your backup, to copy or clone it automatically. When finishing selection, click OK and return to the task creation wizard. Continue creating the restoration task according to this User Manual. All other recovering steps are not specific for obtaining data from Mail.ru Icebox cloud accounts.